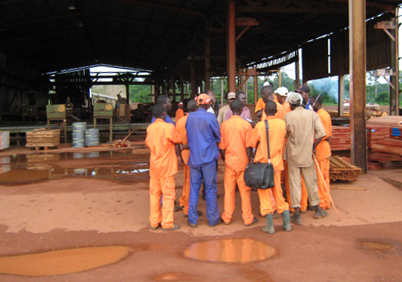 The Béla sawmill is located in Béla, a village in Salapoumbé District, Moloundou Arrondissement, Boumba and Ngoko Département, East Province. Béla is situated 130 kilometres from Salapoumbé, the capital of the District, 100 km from the main road between Yokadouma and Moloundou, and 1150 km from the port of Douala. Béla village, in which the factory is located, is bounded by UFA 10-009, 10-010 and 10.012 and the River Sangha. Specifically, Béla is located to the north-east of l’UFA 10-012, to the east of 10-010, to the south-east of 10-009, and to the west of the River Sangha. The sawmill is located to the north-east of the village, on the banks of the River Sangha, on a plain. 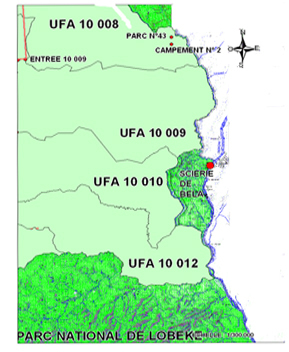 Figure 1 shows the site in relation to UFAs 10-009, UFA 10-010 and UFA 10-012 and the river. Béla is accessed via by two dirt roads which are relatively well maintained and usable all year round, namely the Yokadouma-Mboy-Béla road and the Salapoumbé-Koumela-Béla road. It can also be reached by river (Sangha) or air. SEBAC also has a stabilised-earth landing strip, about 1 km long, in the area (at Libongo). The Béla sawmill was founded in 1996, when SEBAC bought an old factory which had been abandoned several years earlier. The factory was refurbished, and production began in July 1998. The Béla factory was then renamed (SEBAC INDUSTRIE), and became a unit specialising in wood processing and drying. 3 drying cells with a capacity of 450 m³. The Béla sawmill lies on State land, on a site of about 20 hectares. According to information obtained from the company’s management, the procedure for registering the land was commenced in 2003, and its completion is awaited. The Béla Sawmill is owned by Société d’Exploitation de Bois d’Afrique Centrale (SEBAC), a Société Anonyme under Cameroon law, based in Douala. It was founded in 1990, and its activities comprise logging and industrial processing of wood. To develop the processing aspect of its business, in 1996 SEBAC bought an old factory which had been abandoned several years earlier. The factory was refurbished, and production began in July 1998. The Béla factory was then renamed (SEBAC industrie), and became a unit specialising in wood processing and drying. The site is bounded on the east by the River Sangha, about 200 metres away (Figure 2), on the north and west by a buffer area consisting of degraded forests separating the village from the UFAs, and on the south by the residential area of Béla. The site is partly protected and separated from the residential area on the south side by a barrier fence with entrance and gatehouse, and on the west side by a fence with watchtowers. the workshops responsible for packaging, saw filing, and manufacture of mechanical parts for the sawing line. Sheds for thermal power station, boilers and dryers; storage of dried timber. The service station (diesel, petrol and lubricants) with several storage tanks equipped with delivery pumps. Facilities and areas designed for removing sawdust and solid waste and/or sorting recovered wood. North storage area for ayous and sapelli logs, south storage area for logs of other species, and storage area for non-dried timber. Amenities (infirmary, changing rooms, etc.). The various elements described above are shown in the sawmill layout plan in the figure below (Figure 3). The Béla sawmill is an industrial sawing unit with a single production line and a small recovery line. It includes two drying cells with a capacity of 180 m3 each. It is powered by gensets and employs about 60 workers operating in two teams with an annual processing capacity of 50,000 m3 of logs. two diesel-fired gensets consuming an average of 2000 litres of fuel a day. The Béla sawmill employs a total workforce of 160. A distinction is made between full-time and shift workers, according to their working hours. The full-time personnel consist mainly of general service personnel and managers (sawmill manager, foreman and managers of filing workshop, general mechanical workshop and electricity workshop). The sawmill therefore has two multidisciplinary sawing teams consisting of 30 members each, including sawers, filers, welders, mechanics, yard operatives, electricians, warehousemen, drying operatives and cleaning operatives. In organisational terms, the sawmill is headed by a sawmill manager assisted by the foreman and the managers of the filing, general mechanical and electricity workshops. These personnel, who report directly to the sawmill manager, manage skilled staff and manual workers. The manufacturing process at the sawmill has several inputs, with the manufacture of a range of products at the end of the process. The basic raw material is wood (logs) received from the Group’s UFAs, namely UFA 10-009 allocated to SEBAC, UFA 10-008, UFA 10-010 and UFA 10-012 allocated to SEFAC, and UFA 10-064 allocated to Filière Bois. 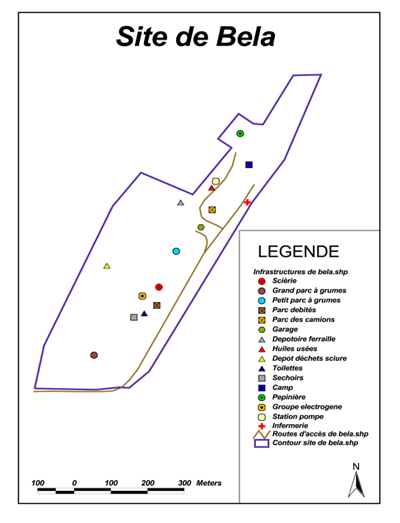 The sawing programme relates to 16 main tree species: Ayous, Sapelli, Tali, Bibolo, Kosipo, Acajou, Iroko, Padouk, Tiama, Bossé, Paorosa, Lati, Fraké, Bété and Anigré. The Béla sawmill consumes an average of 50,000 m3 of logs per annum, with an output of 15,000 m3 of standard timber in various sizes. The sawmill manufactures finished products of various sizes, as required by contracts with customers (between 20 mm x 50 mm x 2.20 m for the smallest and 100 mm x 300 mm x 5.00 m for the largest). Primary processing of the logs produces semi-finished products. Products produced by the workshop that comply with the dimensions specified in the orders are packaged and prepared for transport. Throughout the main production cycle, any pieces that fail to comply with the required dimensions or quality standards, offcuts and waste with usable parts, are sent to the recovery line. The range of products made at the Béla sawmill comprises boards, battens and joists for standard and fixed packages, slats, strips, laths and wedges destined for export. Boards and battens are also stored for the local market; unrecoverable waste is sent for disposal (incineration) or to the local population, subject to authorisation, for various domestic uses. The waste recovery line of the Béla sawmill increases productivity, currently estimated at 30% in standard timber, and almost 75% including the wood used locally. The production of edged timber in the sawmill involves a series of successive operations. This section describes the process throughout the cycle from the entry of the wood to the factory to its exit from the factory (Incoming log yard – Horizontal band saw – Head saw – Edger saw – Resaw – Trimmer – Sorting and recovery – Packaging – Processing – Drying – Storage of timber packages ready for transport). Incoming logs from the forest arrive at the factory on logging trucks; after the administrative formalities, which involve checking the waybill and recording the entry dates, they are accepted, then sent to the log yard and sorted with the aid of front loaders. The Béla sawmill contains two log yards: the north yard for Sapelli and Ayous, and the south yard for Tali, Bibolo, Kossipo, Acajou, Iroko, Béla, Padouk, Tiama, Bossé, Fraké and Bété. The logs are then unloaded from the logging trucks with the aid of front loaders and classified on the basis of wood species and date of entry to the yard on skids made of logs. According to the sawing programme (based on sawmill orders and/or contracts), the logs are removed from the batches, laid on the ground and cut into bolts with a chainsaw. The bolts obtained by bucking logs in the yard are conveyed to the sawing section by front loaders and deposited on the deck, which is equipped with a mechanical system allowing the bolt to be manipulated and introduced into the sawing cycle. This relates to large bolts, and involves splitting them lengthways into two half-bolts or four quarter-bolts (billets), so that their dimensions are compatible with the head saw. Horizontal sawing is performed with a 22 kw Landoni horizontal chain ripsaw. In view of the small number of bolts ripped, the horizontal saw only operates occasionally. Performed with the head saw, and involves cutting the bolts or billets conveyed from the horizontal saw into planks of a fixed thickness, as required by the order. The head saw is a Brenta vertical saw with a flywheel diameter of 160 cm; as the clearance between the knees (the bolt clamping system) is 160 cm, the head saw cannot saw bolts of a size exceeding 160 cm. The operation is conducted by a sawing specialist housed in an automated cabin equipped with a laser system that optimises the sawing stroke. He is helped by an assistant positioned in front of the deck, whose task is to ensure that the bolt to be sawed does not contain nails, to remove hanging bark, stones and steel S’s, and to tighten the saw if necessary. Planks are sawn at this workstation. This operation is performed with multi-blade edger saws, and involves splitting planks into sections of a width complying with the order. Plank edging also uses the laser to optimise the saw stroke and minimise defects that may be perceived in the planks. It involves sawing the planks parallel to the grain to obtain timber of uniform, regular widths, with edges at an angle of 90° to one another. This operation involves using a small vertical saw to recover sawn wood containing minor defects. Parts with defects are completely removed, and the width required by the order is obtained. This operation is performed with electric circular saws or trimmers fixed to bucking tables. End trimming involves cutting off the ends of the edged wood to obtain its final length. The timber thus produced is sent for packaging. AD packaging (wet order): the wood packages are sent direct to customers. When the packages have been formed, they are strapped with a steel strap and identified by labelling with paint. 90% of white woods such as Ayous are dried in the boilers before storage to prevent deterioration caused by fungi and insects. The Béla sawmill has nine drying cells with a total capacity of 180 m3. The drying time in the dryers varies according to the performance of the dryer and the species of wood used as fuel. The drying heat is supplied by incineration of waste wood (sawdust, slabs, edgings etc.) in a boiler. The heat produced heats water, which is conveyed by a circuit to the walls of the drying rooms where it releases its heat into the room; it then cools and returns to the boiler via another circuit to recover heat and recommence the cycle. Thus the circulation of hot water gradually heats the drying rooms and their contents (in this case, wood). As it is heated, the wood loses water and dries. 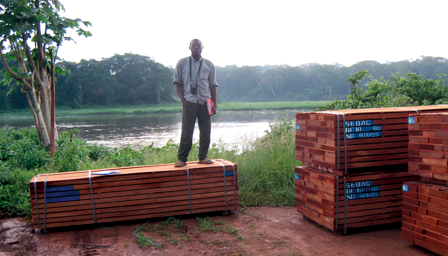 Pending transport to Douala, the dried timber is packed in polyethylene (plastic) sheets, and stored in a shed on site. The undried timber is placed on pallets in the storage area, in the open air, or packed if necessary.